The next level of quarterback analysis is upon us. While the PFF grading system currently adds necessary context to quarterback performance, we’re adding a new layer of detail that can further separate quarterbacks on a throw-for-throw basis. Defining accuracy has been a challenge through the years and there are still circles in which completion percentage is held as the standard for measuring it. PFF’s adjusted completion percentage has ironed out some of the inherent flaws associated with completion percentage, absolving quarterbacks from getting downgraded for throwaways, spikes, batted passes and plays in which they’re hit while throwing, but there’s yet another step that must be taken to properly encapsulate a quarterback’s accuracy. With that, we’ve started tracking actual ball location for every NFL quarterback and select NFL draft-eligible quarterbacks. Did the QB put the slant route on the front number for optimum yards-after-the-catch opportunity? Did he hit him with an accurate pass on his frame? Did he leave it in a catchable spot, but in a less-than-desireable YAC location? 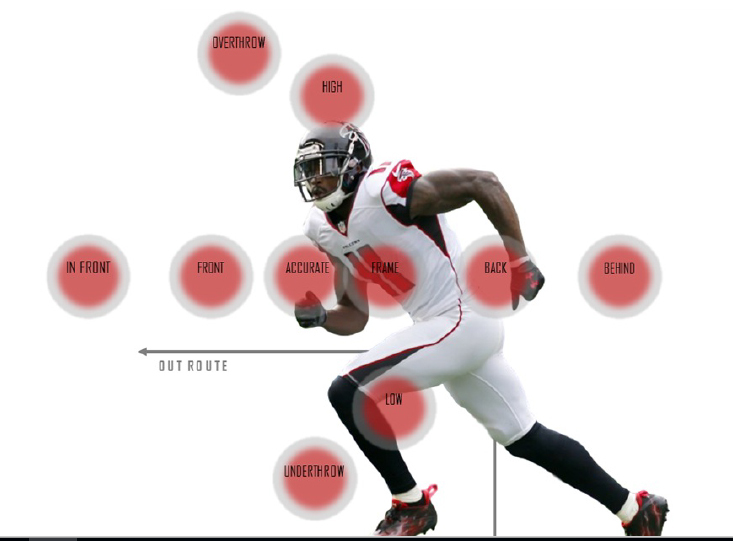 We will answer all of these questions and more with PFF’s advanced quarterback analysis. In addition to ball location, the specific throw type, primary coverage type and level of receiver separation will be added to the mix in order to add even more context to each throw. The last piece we’ve added is a description of the quarterback’s “look” on each play, noting the side of the field where he started his read and whether or not he worked beyond his first look. Those six pieces of data have already proven extremely valuable in our trial runs and there’s even more to come down the road as we continue to optimize our quarterback evaluations. Throw location matters. It may sound intuitive after years of hearing how important it is to hit the slant on a receiver’s front number, but we now have the stats to back it up. Perfect ball location on “expected” throws leads to higher yards after the catch than all other throws. A step below “perfect” is a pass on the receiver’s “frame” which still represents good ball location, it’s just not the most optimal spot. We’ve also seen that passes that are catchable, but in suboptimal location – high, low, front, back – are valuable, but not nearly as valuable as “accurate” passes and yards after the catch take a hit when the receiver has to make an adjustment. We are also careful to add proper context to passes that appear to be off-target but are thrown away from the leverage of the defense. Such passes get an “away from coverage” designation that falls into the proper bucket of accurate passes. Using these three categories puts the 2017 NFL average for accuracy at 56.8 percent and average for “perfect” passes at 16.0 percent. These passes are all somewhat on the receiver’s frame and in a “catchable” range, but they’re “inaccurate” in at least one of four directions. The uncatchable bucket includes a number of other categories, including plays made by the defender, but the basic concept is the quarterback is throwing a pass that is uncatchable either due to accuracy or a lack of velocity. In order to properly give credit and blame where it is due, there are a number of other categories that are charted when a clear accuracy cannot be assigned. From the route being cut off to various types of miscommunications, these results all fall into the “other” category. We’ve identified the different style throws a quarterback will make from stick (on a line, receiver facing quarterback), to a lead across the field horizontally, to a lead vertically up the field, to over the shoulder throws and much more. While we’ve been tracking the primary coverage defender for years and we have a general bucket for the coverage being played by the 11 guys on the field, “coverage type” is used as a descriptor for the primary coverage defender. From man coverage, to hole in zone, to single coverage where the defender is playing the “top” of the route, it’s an important layer of detail when creating the full picture. Level of separation is another important aspect of the analysis, and we kept this one simple. If a receiver has a step or two of separation, it’s defined as “step” and anything more than that is defined as “open.” The other significant definition is “closing,” which is the sister to “step” but is based upon a defender closing in on the receiver with one to two steps of separation, rather than the receiver running away from the defender. The last designation is “tight,” which is simply a defender within a step of the receiver. If the quarterback throws the ball to the side of his first look, it goes down as a “1,” while coming off that side to a read later in the progression warrants a “2.” We’ll also identify check downs and passes thrown on scramble drills. While the PFF evaluation does a fine job of properly crediting the quarterback’s role on each play, this new system of play-by-play charting will only enhance those results. 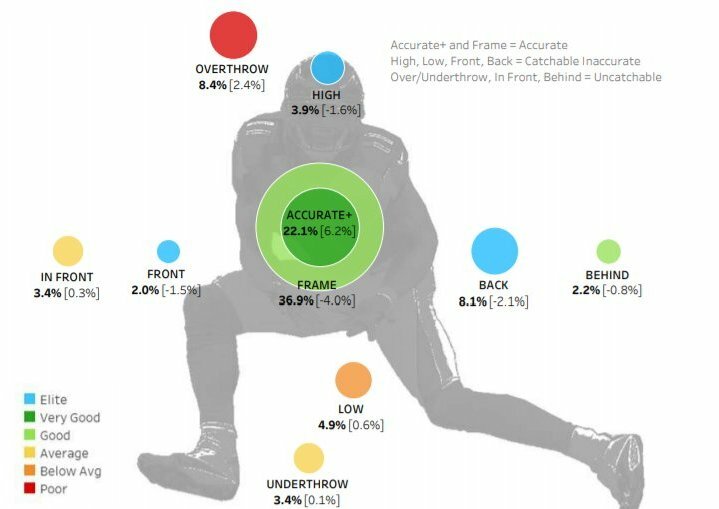 Quantifying “real” accuracy on various throw types against different coverages and varying level of separation by the receiver will add a never-before-seen layer of context to each quarterback’s skillset. Every team would love to have a quarterback who puts up a good completion percentage, high yards per attempt and gaudy passer rating, and while those are all great goals for a passing offense, this next-level quarterback charting allows us to further quantify how to best achieve those results and just how much the quarterback, receiver and defense affect those results.